This is not news. Anyone who has looked at the country's fiscal mess with a minimum of objectivity has known this for years. We've been writing about it here; former U.S. Comptroller David Walker has been shouting the message in every forum that will have him; Ron Paul has hammered away at the issue in the Congress. But only recently have any of us encountered more than a deaf ear in most of Washington. Finally, the problem is being taken as seriously as it should be. Late last year, the bipartisan Deficit Commission's recommendations to cut the national debt by $4 trillion by 2020 were savaged by both the left and the right. More recently, the headlines have gone to President Obama and House Budget Committee Chairman Paul Ryan, as they trotted out their dueling deficit-reduction programs. In both cases, though, the projections just don't add up, say those who have studied them. And that's assuming either is adopted as is, which is unlikely considering the fighting that has erupted over cutting billions when it's trillions that are at stake. Meanwhile, the Fed has been printing money as if there are no consequences, pushing us ever further into debt. Many people probably (and understandably) think that the problem is intractable... that we're doomed to go bankrupt. Or worse. With no reforms in sight that look like they might work, the Heritage Foundation has stepped up to the plate. 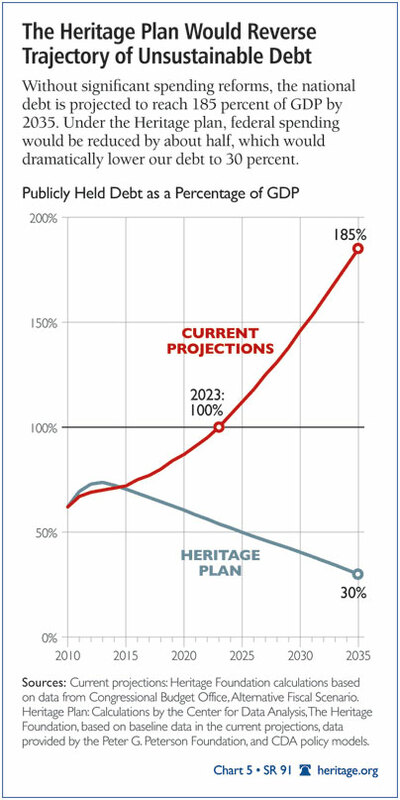 On May 10, the conservative think tank offered a report entitled Saving the American Dream: The Heritage Plan to Fix the Debt, Cut Spending and Restore Prosperity. The plan, the authors write, "balances the nation's budget within a decade - and keeps it balanced forever at no more than 18.5 percent of GDP. It reduces the debt and cuts government in half. It eliminates government-mandated health care and fully funds our national defense. It squarely confronts Social Security, Medicare, and Medicaid, the three so-called entitlement programs, which together account for 43 percent of federal spending today." Further, it "redesigns our entire tax system into an expenditure tax that will have a single, flat rate. This is a structure that will promote savings, therefore benefiting individual Americans, our body politic, and the economy." This is no stopgap measure. But something far more than a stopgap measure is obviously needed. How they propose to do it is too complex to cover in any detail here. And promising to keep the budget balanced "forever" is a claim that requires considerable chutzpah. Someone more savvy than me will have to crunch the numbers on that one. But the ideas seem sound. Here are a few of the high points. Social Security: A gradual transition to a flat benefit system ($1200 per month in 2010 dollars that would be indexed in future years), to protect seniors from the risk of poverty. Reductions in benefits to high-income seniors beginning at $55K/yr. and a complete phase-out for singles earning $110K or more and couples earning $165K. Minimum retirement age raised to 68, an annual tax deduction of $10K for anyone working beyond that age, and tax on retirement income eliminated. Creation of an optional retirement savings plan that would not be double-taxed. Medicare and Medicaid: Repeal of Obamacare. Transitioning of Medicare from an open-ended, defined-benefit entitlement into a budgeted program that focuses Medicare subsidies on those who need them most, modeled after the Federal Employees Health Benefits Program (FEHBP), the health care system for members of Congress and federal employees. Seniors enroll in the health plans of their choice and receive a defined contribution (known as premium support) toward the cost of their plans. Support is reduced for upper-income seniors and eventually phased out for those with the highest incomes, but all seniors will have access to the same Medicare system with no need to buy a separate plan to cover catastrophic expenses. Poor seniors remain eligible for Medicaid assistance. As with the Social Security adjustments, Medicare's eligibility age becomes 68 in ten years and is indexed thereafter for increases in longevity. Tax credit/assistance program for Medicaid recipients, with a larger measure of state control over its administration. Other savings: Reduction of non-defense discretionary spending from the present 4.5% of GDP to 2% by 2021. Reduction of defense spending to 4% of GDP and maintenance at that level. Allowing states to retain gas tax revenues and spend them on their own highway priorities, provided they maintain a minimum standard of interstate highway maintenance. Reduction of federal K-12 spending to 2000 levels (adjusted for inflation), while ensuring that all Americans will have access to some form of financial aid for attending college. Replacement of farm subsidies with farmer savings accounts. Turning local job training, justice, environmental, or community and economic development programs back to the states. Changing the budget process to impose enforceable caps to reduce total federal spending to 18.5% of GDP by 2021 (including entitlement programs) and then maintaining spending at that level. Tax reform: A unified, single rate that taxes uniformly all income sources that are spent on consumption, with deductions only for higher education, charitable donations, and mortgage interest. Encouragement of savings and restructuring of business taxes. The above ideas only scratch the surface, but are all we have space for here. Those interested should read the entire document (some of which could be clearer), and critiques are welcome. One thing the Heritage Foundation plan does not do is address the costs of waging two (or three or more) discretionary overseas wars; it also doesn't question maintaining the presence of large numbers of American troops on foreign soil in non-conflict situations; and it doesn't critique the domestic war on drugs. It assumes that all of these will be ongoing, whereas the curtailment or elimination of one or more of them would result in very significant savings above and beyond what the plan envisions. Nor are changes to either Homeland Security or federal assistance to local law enforcement contemplated - and these could surely do with some serious reform. Nevertheless, Heritage should be commended for its effort to design as comprehensive a plan as they've presented. Both the Administration and Congress should study it.